Sometimes, you just have to follow your gut, literally, because sometimes, that gut will take you to some of the weirdest places and find some of the best food. J and I used to live at Candlewyck Apartments on Kilgore and we used Burdick to get downtown quite a bit to avoid the traffic on Westnedge. One day, many, many years ago (well, five anyway), we noticed a couple of smokers set up outside of an empty store on the corner of Burdick and Cork. Not long after that, a party store opened in that empty building and those smokers were being used on a regular basis. Fast forward five years, we still haven’t stopped in the party store which is now Burdick Hair & Beauty Supply. The smokers are still out front and every time we drive by, there is still smoke coming out of them. Somehow, last week, I chipped J’s windshield while driving on I-94 and we needed to get it replaced. It was too big to fix and the crack was slowly getting bigger. I had the day off on Thursday, so I set up an appointment at Safelite to get it fixed. Unfortunately, it took much, much longer to fix the windshield than what we were told. When I took J back to pick it up, they still weren’t finished, so I let her take my truck and I stayed with her car until it was finished. I hadn’t eaten lunch yet and it was just after 4:00, so I was pretty hungry. For some reason, BBQ just sounded good and I figured today was as good as day as any to stop in to see what kind of BBQ the beauty supply store could offer up. 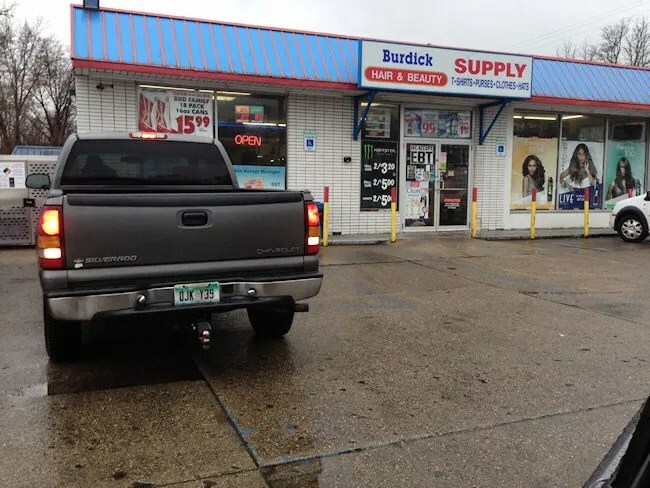 The Burdick Hair & Beauty Supply store is a mix between a party store and a beauty store. They still have most of the things you want from a party store plus the things you’d expect from a beauty store. 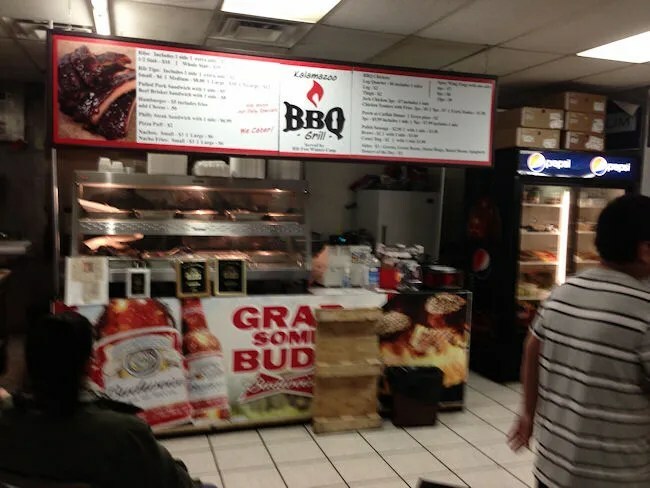 In addition to that, they have some damn good BBQ. 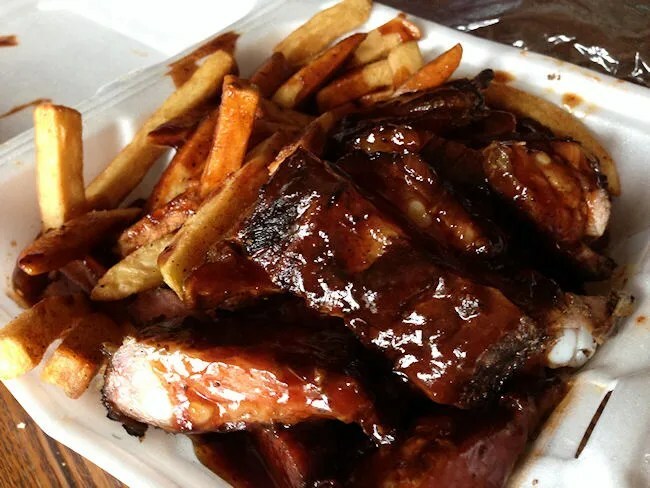 Kalamazoo BBQ Grill is a coop of a couple different Rib Fest winners. The small take out counter is in the middle of the store with not much more than a couple of fryers, a flat top,and some warming pans on a counter. The thing that really surprised me was just how big their menu is. They have all the BBQ favorites alongside rotating sides, burgers, and hot dogs. For some reason, rib tips just sounded incredibly delicious at that particular point in time. The people in front of me were having a hard time ordering, so the cook looked at me and asked what I was going to order, so he could get started on it. The rib tip dinners come in four different sizes and all come with choice of one side. I ordered the large and got fries for my side. They also had mac & cheese, baked beans, and spaghetti amongst other things as the sides for the day. The cost for the meal was exactly $10 and it took about five minutes for the tips to be chopped up and covered in sauce. It took a few more minutes for the fries to cook up. Once they were done, I was asked if I wanted sauce on them as well and since they had Rib Fest awards for sauce on display, I said yes. The Styrofoam box almost couldn’t contain all of the food in it. I was just hoping it wouldn’t explode in my truck on the way home. I started in on the fries covered in BBQ sauce when I got home and got settled. The fries were out of the bag restaurant fries with and really delicious, thick, sweet sauce on them. I had blown through almost all of the fries before I even thought about getting in to the meat. The large order of tips should have been more than enough to feed a couple of people, but I was hungry and sometimes, I eat enough for two people. This happened to be one of those times. The delicious smoked tips were swimming in the same sweet, sticky sauce that was on the fries. They were nice and smokey, but not super tender. There were some pieces that I really had to bite through while there were others that just melted in my mouth like butter. 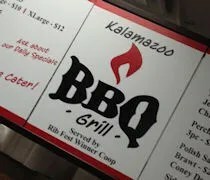 It’s a little hard to believe Kalamazoo BBQ Grill could be hiding in plain site. The BBQ from this small stand is pretty delicious. I’m a little mad at myself for not stumbling in to this place a little sooner.